How many gundog men in Britain know of the lesser known German gundog breeds like the small Munsterlander, the Heidewachtel, the Stichelhaar and the Pudel-pointer? What do any of us know of the Dutch breeds like the Stabyhoun, the Drentse Patrijshond and the Wetterhoun? I spotted a Portuguese Perdiguero at the Game Fair but only see the Burgos Pointer at World Dog Shows. We now favour the hunt-point-retrieve breeds but show little interest in promoting the bark-pointers, as sporting gundogs in the field, from Scandinavia. The American Cocker features at our dog shows but the American Water Spaniel is absent. Of the foreign gundog breeds recognised by the Kennel Club, those from Germany dwarf any other national contribution, and, bearing in mind the proximity of France, it is surprising that some admirable French breeds have gone unfavoured here. 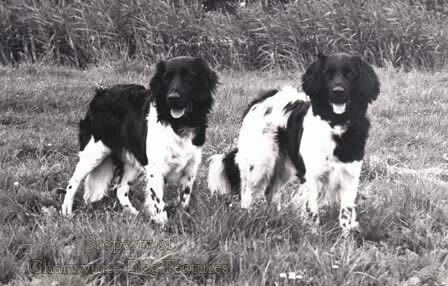 The braque and epagneul breeds are still not favoured by British sportsmen, despite their field prowess and the growing and justified popularity of the Brittany. Of the many French breeds of gundog, the latter is the only one recognised here as such, of the dozen or so in existence. The French Poodle, once a water-retriever languishes in the Kennel Club's Utility Group, whilst of its sister breeds, the Italian Lagotto Romagnolo is destined to be, and the Spanish Water Dog is, listed in the Gundog Group, the Portuguese Water Dog is in the Kennel Club's Working Group and our Irish Water Spaniel is acknowledged as a gundog. The likely founder of them all, the Barbet or woolly-coated pointing Griffon, is unknown here, although its diminutive form, the Barbichon or Bichon family of Toy dogs, is favoured. The first time I saw a Brittany I thought it was a Welsh Springer Spaniel, so vivid-red was its coat. And the connections between Brittany and Wales are many; the rough-coated Welsh Foxhound has a distinct 'griffon' look to it. 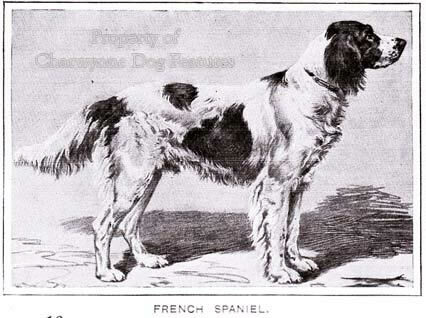 The first time too that I saw an Epagneul Francais, I thought it was an Irish Red and White Setter. It is easy to mistake a Braque St Germain for our Pointer or to identify the bigger Braque Francais as a GSP. 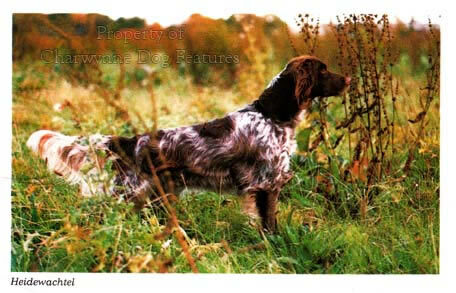 The Epagneul Picard can be confused with a heavily flecked blue belton English Setter. The Epagneul de Pont-Audemer has a whiptail look to it and the Griffon a poil dur or Kortals Griffon is much like the Cesky Fousek and the Drahthaar or GWHP. Most likely lost to us are the gundog breeds of Griffon Picard, Dupuy and Charles X Pointer, with the Boulet Griffon and the Braques from Ariege, Auvergne, Gascogne and Bourbon surviving but not flourishing. 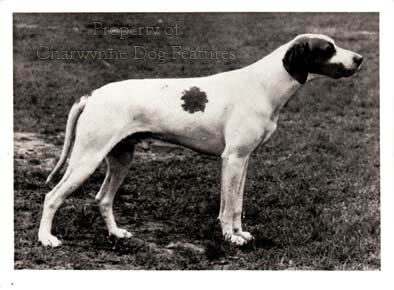 The Bourbonnais Pointer is shown at FCI shows, with over 100 registered annually, after nearly disappearing in the 1960s-70s. Some are born tail-less or with just a rudimentary tail. A distinctive breed, with a very individual coat colour, roan, with a pattern described either 'dressed like a trout' or 'lie de vin' (dregs of wine). I have heard this breed described as a short-haired Brittany in North America but my French colleagues dispute this. It is good to know that such a distinctive sporting breed has been saved. Sportsmen who conserve an old gundog breed so often get little support and I commend the work of those here who work hard to keep our native breeds, like the Clumber, Sussex and Irish Water Spaniels true to their heritage and employed in the field. The rebirth of a distinctive gundog breed like the Braque du Bourbonnais, now being used on partridge, grouse and pheasant, but also versatile enough to be used on rabbit, if trained for small game, is heartening. Around 45lbs, 22" at the shoulder and cobbier than most braques, the breed once suffered from the strict pursuit of certain colours and markings, which is never good, in the long term, for any gene pool. All sporting breeds should be bred on their prowess not their coat colouration. Nose, mouth, response and keenness to work will always matter more in this breed than correct 'faded lilac' or 'peach blossom' coats. A gundog's gene pool should be based on field capability not cosmetic whim. I have yet to meet a French sportsman who is proud of the Poodle, but I admire them. 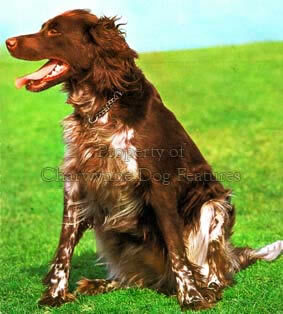 They are clever dogs and the standard variety is underused as a gundog. Clipped to look like a Curly-coated Retriever, they look workmanlike and utilitarian, rather than exhibition items. Years ago, a Dorset sportsman used them extensively as retrievers and never found them wanting. A French sportsman, so anxious to distance his country from the Poodle, assured me that they were Russian in origin and German in development. He cited the Pudelpointer and the Schafpudel as German variations on the type. The word Pudel is German and the French do call the breed the Caniche, derived from Chien Canard or duck-dog. My French colleague insisted that the French water-dog was the Barbet and the German the Pudelhund. The corded Poodle or schnur Pudel has been dubbed the Russian Poodle. The 19th century German cynologist Dr Fitzinger listed six different varieties of the breed, but maintained that the standard version originated in north-west Africa. One French gundog breed which always impressed me when working in mainland Europe was the Korthals Griffon, some now being worked here. The ones I saw were steel-grey with chestnut, with a weatherproof coconut-mat texture to the coat, Korthals being renowned for his views on coat in working gundogs. He tried to convince the Germans that the French name 'griffon' belonged not to a typical French breed, but to a dog that had the same ancestry as the rough-haired German pointers. His three dogs at the 1878 Frankfurt show were entered as Griffon a poil rude, not a poil dur, i.e. harsh rather than stiff. One of his founder dogs was a Barbet, to ensure prowess in water. What was so impressive about this breed in the field was their single-mindedness, their seriousness of intent. Now, sadly, some of our native gundog breeds are clowns, with limited attention spans, not a good feature in a gundog expected to work diligently for extended periods. The all-rounders have made good ground in Britain despite the early scorn from hidebound gundog writers in sporting magazines a couple of decades ago. The French all-rounders deserve a chance here. The HPRs have caught on with British rough-shooters; they are not utility dogs for tyro-sportsmen but complex dogs for the knowledgeable, maturing later and demanding more time and more enlightened handling. They present no threat to our native specialist gundog breeds and appeal to those seeking a ground-scenter and an air-scenter, a soft-mouthed retriever and a game-finder, able to range wide or close according to terrain. The French can provide the hound-like braques, the setter-like epagneuls or the griffon type; they are worth considering on sheer merit. There are quite a number of little-known foreign gundog breeds awaiting interest from our sportsmen. Their introduction need not penalize our native breeds but does need to be based on knowledge of their needs and employment, rather than whim or circumstance. The German pointers came to our shores because experienced sportsmen serving in the British Army in Germany became aware of their talents; they came here on merit not a sudden fancy. Not every foreign breed imported with enthusiasm stays on to become a feature and that’s not good for dogs and certainly not good for inexperienced sportsmen.